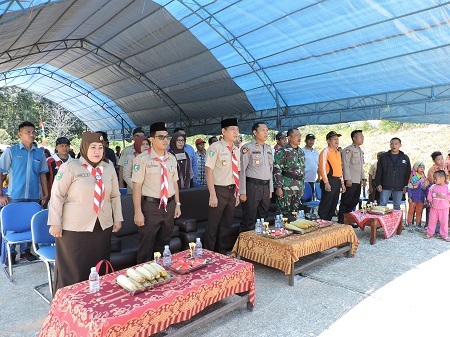 The commemorated of Shadowless Day was scheduled on the event calendar of the Tourism Department of Kutai Kartanegara Regency, this event was carried out more than two days of camp activities in Equator Monument of Marang Kayu and attended by Head of the Tourism Department of Kutai Kartanegara Regency, head of the fields, head of the unit works, hundreds of residents and Tourism Scouts. In the geographical equator (Arabic) and equator (English) is a line of imagination that is drawn in the middle of the planet between two poles and parallel to the axis of rotation of the planet. This equator divides the earth into two parts of the northern hemisphere and the southern hemisphere. The Equator is also called khatulistiwa (in Indonesia). 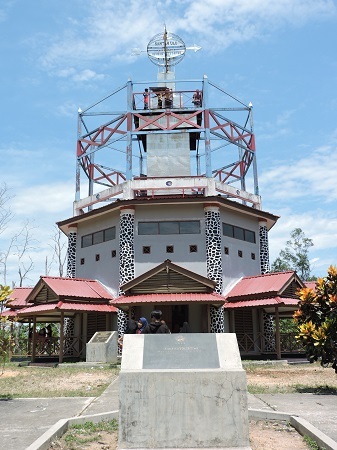 The Equator Monument of Santan Ulu is an imaginary equator line marker located on a hill nearby the highway of the Bontang - Samarinda Km 25, Santan Ulu in Kutai Kartanegara Regency, East Kalimantan Province. This monument was buil in 1993 by Karya Bakti LATSIRTADA (Integration Training of Taruna Wetda Nusantara) and were inaugurated by Indonesian Armed Forces Chief is Armed Forces General Faisal Tanjung. In 2010/2011 the Equator Monument was renovated by PT. Kaltim Methanol Industri and Kodim 0908 / BTG. At Santan Ulu, we can enjoy the phenomenon of a day without shadow, scientifically a day without a shadow as the Main Transit, namely when the sun is at Zenith's point, called Kulmulasi if a day without shadow occurred in a territorial, the middle sun stops right at the point over the region. In Indonesia it only occurs at several points in the sun's emulation or Ekinos, occurring twice a year on March 21-23 and September 21-24. 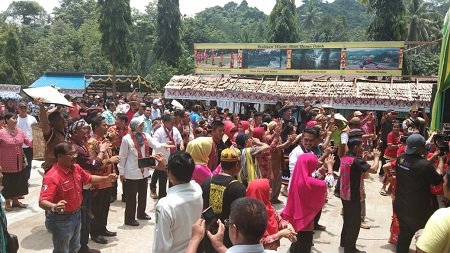 The Pale Sticky Rice Harvest Ceremony was carried out again in the framework of "Ngetooq Ngotamp Parai Puluut Manguur" which was carried out by the people of Putak Hamlet in Loa Duri Ilir Village, Loa Janan Subdistrict, whose implementation coincided with the phase of cultivation namely phase of the pale sticky rice harvest. 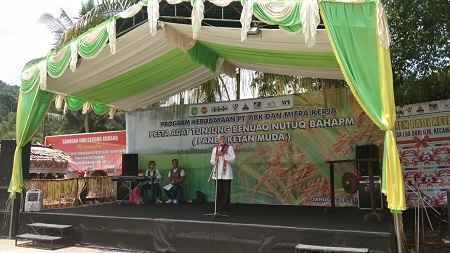 The Harvest Ceremony was attended and opened by the Head of the Tourism Department of Kutai Kartanegara Regency, Dra. Sri Wahyuni. MPP. 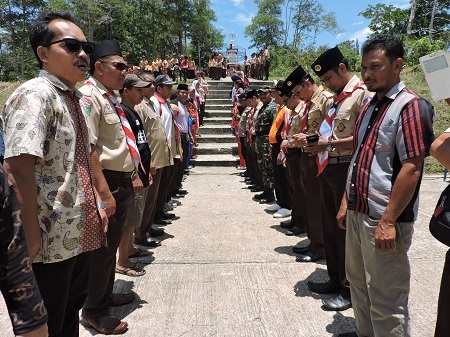 do together with Muspika elements of Loa Janan, ABK Company Management and work partners (Cultural Program) as the coach of Putak Hamlet cultural customs, The Customary leaders and the leaders of Loa Duri Ilir Village. On the occasion, The Head of the Tourism Department of Kutai Kartanegara District, Dra. Sri Wahyuni. MPP. in his speech conveyed that "Corporate CSR builds infrastructure only, but here is different. Here there is cultural development and human resource development. I appreciate the company in Loa Janan Subdistrict just like ABK and partners which is concerned with preserving the local culture in Kutai Kartanegara. Then she explained, the local culture that began to erode if no one cares about preserving, it is certain that the culture in the community will be lost.In addition, she appreciated the farmers in Putak Hamlet who are still paddy fields. front can increase rice productivity that has been cultivated so far. She hope in the next the increase of rice productivity that has been cultivated. 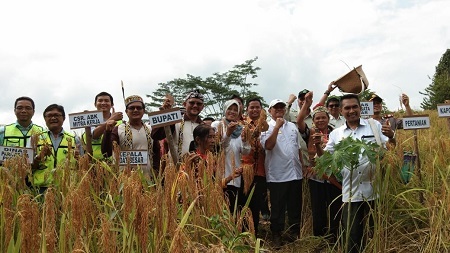 Followed by the presentation of CSR Manager of PT ABK, Agung Hasanudin, said that the rice planted by the local community is rice from Lemongrass and Mayas varieties. Rice specifically on dry land is different from rice varieties grown in wetlands such as rice fields. The harvest process is also different, the Putak community harvests rice using ani-ani to picking strands after strands. It is well known that every year the residents demonstrated of making baham process. Namely Dayak traditional food made of sticky rice which was accidentally picked while still pale but already contained, the harvested sticky rice then roasted with the shells. Once cooked, then pounded in mortar. Subsequently filtered, removed shells and cleaned. Then mixed with brown sugar and grated coconut. This is a traditional food that is served to visitors at the harvest ceremony. 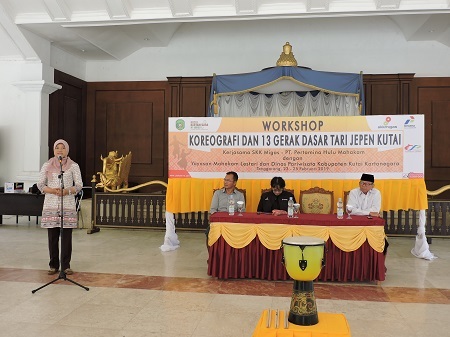 The Choreography Workshop and 13 Basic Kutai Jepen Dance established for introducing and continuing to preserve the Kutai Jepen Dance.The event held at the Kutai Kartanegara Sultanate Kedaton as a form of cooperation between SKK Migas - PT Pertamina Hulu Mahakam, Mahakam Lestari Foundation and the Tourism Department of Kutai Kartanegara. 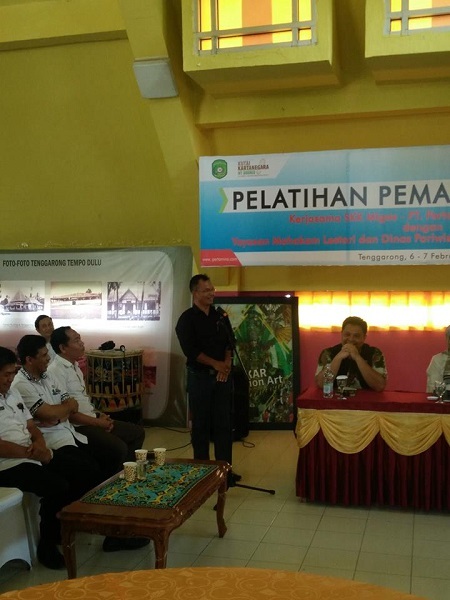 This event held for two days and opened by the Head of Tourism Department of Kutai Kartanegara Dra. Sri Wahyuni. MPP. to know that Jepen Dance is an artistic creation that arises in the midst of the general public combines dance elements that exist in tribal dances that dwell (stay) in the coastal area and the art of Kutai Folk Dance. 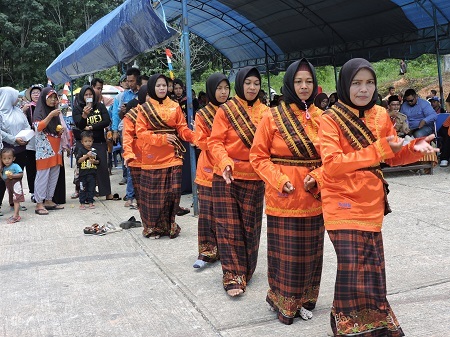 Jepen dance is Kutai folk art influenced by Malay and Islamic (Arabic) culture. This art is very popular among the people who live on the coast of the Mahakam river and coastal areas. This dance is usually dragged in pairs, but can also be single-drawn or just young people. This jepen dance is accompanied by a song and the rhythm of typical music from Kutai which is called Tingkilan. The instrument consists of stringed instruments (type 6 guitar strings typical of Kutai), ketipung (like small drums) and Terbang (like rebana), because of the popularity of this art, almost in every sub-district has distinctive feature of jepen groups and the tingkilan. More than two days of workshop, the participants were given material and taught the basic movements of the jepen dance. The Pakem (Basic) of Jepen dance are wave, half samba ( turn ), a full samba (swivel), a swinging child, a pat, belau step, and ketam step , gasing rotate, setep and tactile. In the Malay, Jepen known by many names in accordance with the identity of the atmosphere of the region. the creation of the dance are jepeng dance, zaping dance and japing dance, the difference is Malay culture rooted in the local tradition community. Jepen dance is one of the social dances of the Malay people and usually withdrawn in various joyous activities or people's parties. Continued with the introduction of Kutai Jepen costumes are a Chinese outfit that if other areas are usually called telok belanga clothes, these Chinese clothes that are used in the daily life of the Kutai people. 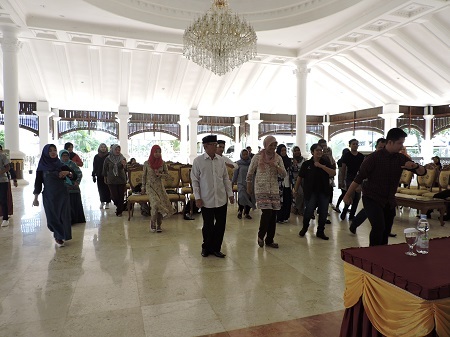 Then continued to the introduction of Jepen basic movements followed by all Jepen participants from several district of Kutai Kartanegara regency are Anggana, Samboja, Muara Jawa, and Tenggarong. 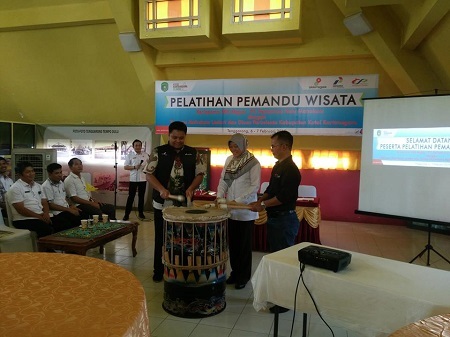 Tourism Department of Kutai Kartanegara Regency in cooperation with SKK Migas - PT. Pertamina Hulu Mahakam and the Mahakam Lestari Foundation. Has conducted a Tour Guide Training for two days at Jam Bentong, Tenggarong Visitor Center from (6/2/2019) to (7/2/2019). 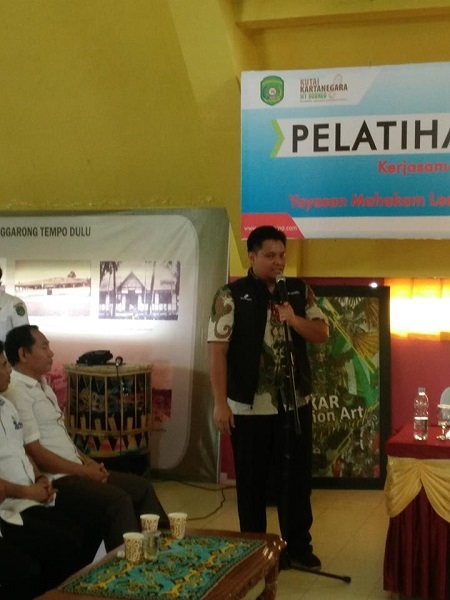 The event was opened by the Head of Kutai Kartanegara Tourism Department Dra. Sri Wahyuni. MPP., And was attended by all head of the fields and head of the unit works of the Tourism Departmen. 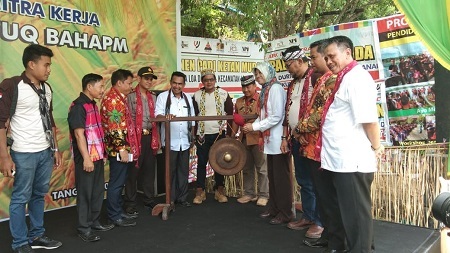 The participants will be guided for two days by the Chairman of the Regional Representative Council of the Indonesian Tourist Guide Association (ITGA) of East Kalimantan Province Rusdiansyah. 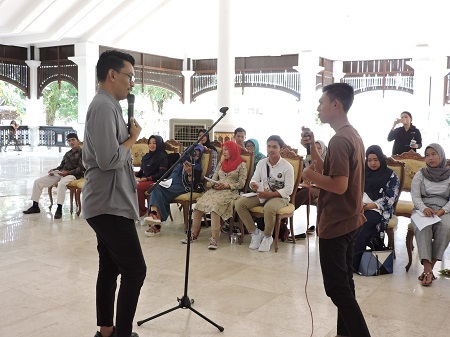 During the activity all participants were happy with the presence of the instructor Rusdiansyah because of his humorous nature while teaching. On the first day participants will be given some material. The first material was delivered by the Head of Kutai Kartanegara Tourism Department Dra. Sri Wahyuni. MPP. Concerning the role of tour guides in enhancing the image of the tourist attraction of Kutai Kartanegara. The include contents are tourist attraction (DTW), tourism Human Resource, image of tourist attraction, the role of tourist guides for the image of tourist attraction. She explained that there are 7 Main of Tourist Attractions in Kutai Kartanegara for foreign tourist, count from the highest visit to lowes are BOSF Samboja, Bengkirai Hill, Tomb of the Kings of Kutai Kartanegara, Mulawarman Museum, Lamin Etam Ambors, Tenggarong Wood Museum, River Tourism Mahakam. And Main Tourism Attractions in Kutai Kartanegara for local tourist count from the highest visits to the lowes, are Kumala Tenggarong Island, Ladaya Tenggarong, Raja - raja Tenggarong Cemetery Lamin Etam Ambors Samboja, Pangempang Muara Badak Beach, Mulawarman Museum, Tanah Merah Samboja Beach, Sambera Beach, Marang Kayu Kresik tourism village and the last is Pemedas Beach. The material was further conveyed by Mr. Rusdiansyah, he explained where was the understanding of guides is someone who is responsible for providing guidance, services and guidance on Indonesian tourism objects and helping everything needed by tourists. A tour guide must have a caring personality, sharpness of memory, good at getting along and cheerful, honest, initiative, humorous, helpful, empathetic, and a good leader. He also teaches that a guide must be able to make a very memorable and unforgettable journey. first determine the farwell place that are comfortable and impressive, ask for impressions and messages, during the trip, give the opportunity to deliver a message and impression, remain their luggage, sorry and thank you and finally see you next time in another tour. Not only learning in the form of material, but also a direct instruction like inviting participants immediately visiting tourist attractions in Tenggarong such as visiting Kumala Island which is one of the most visited tourist attractions.